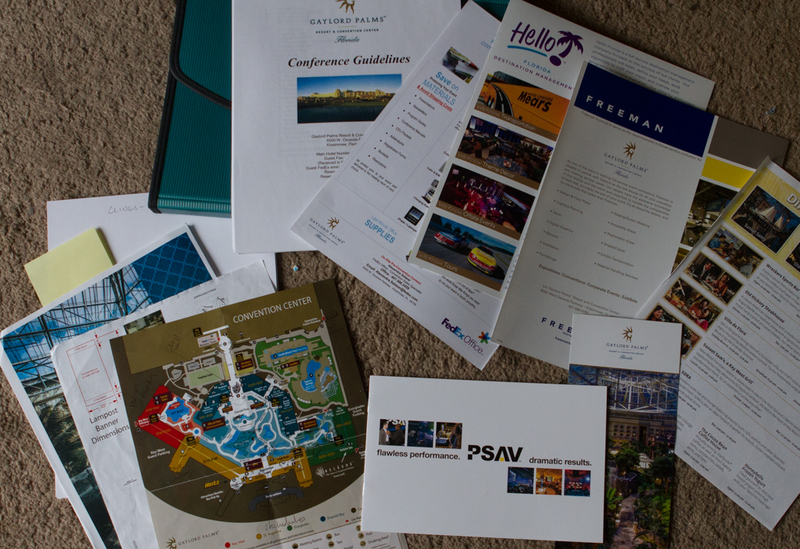 This is a study of all the work that went into branding a convention center for the unveiling of a new fashion line and the training of Stylists for the future season. I decided to break this up into 3 parts after realizing I had over 100 photos to show the whole process, and this still only showed a fraction of all the work involved in branding a convention center. Part 1 begins with the initial stages of planning. Read part 2 or part 3. 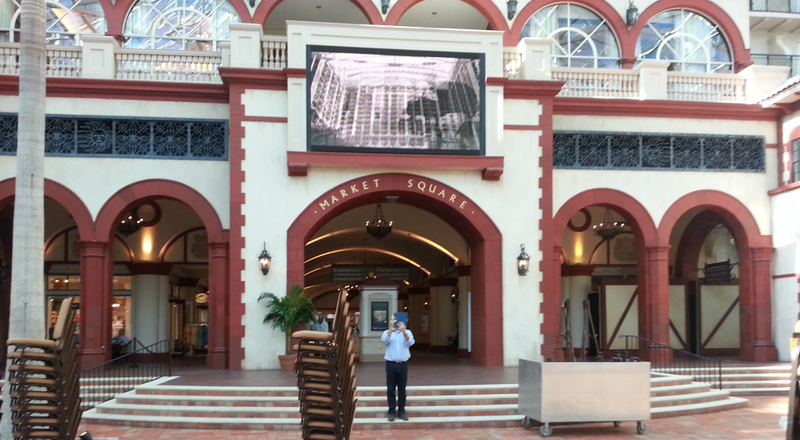 We, being the events department our vendors that we use for extra events management and stage management, and various project managers, started with a site visit to the Orlando Palms Gaylord roughly 5 months before our event would take place. 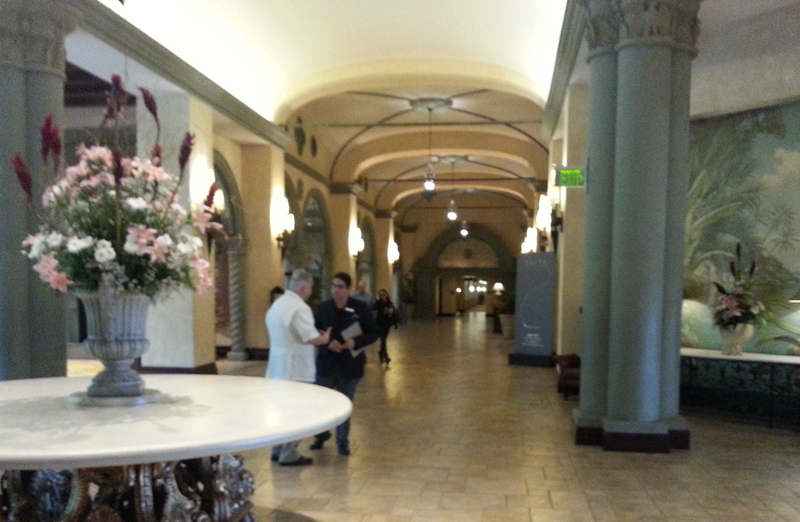 We met with the various hotel, convention center, and rigging staff. 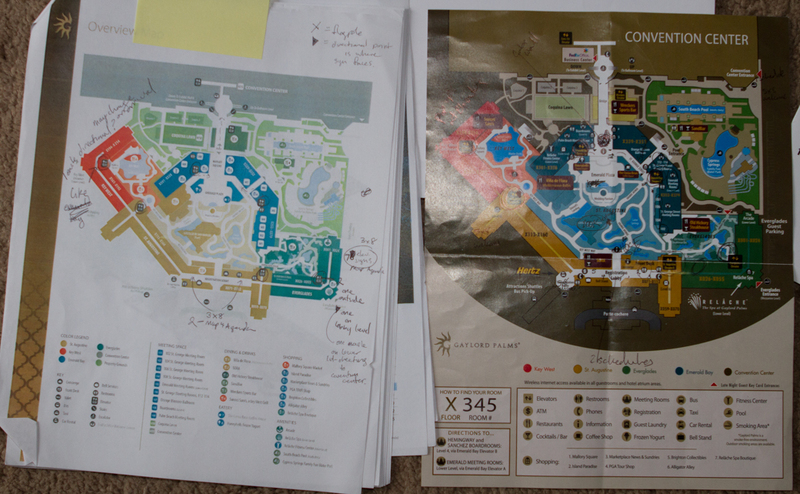 We were given all the materials that the Gaylord had about vendors, maps, and previous venues décor. You can see below how the center’s previous venues had been very conservative in their signage placement. After this brief meeting we began to tour the site. We began at the hotel lobby. 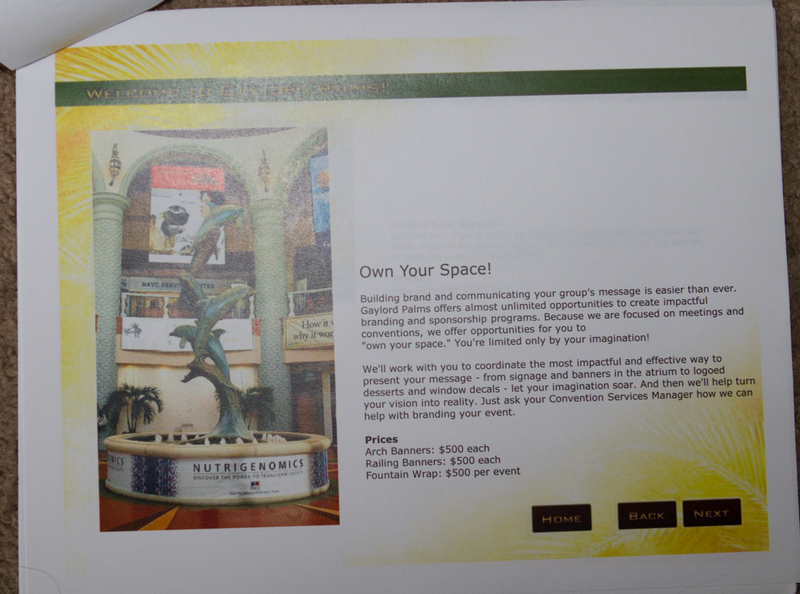 There were many ideas on what could be done here in the lobby, but eventually most of them were nixed by the hotel and convention center as they didn’t want our brand to overpower the hotel’s brand. Eventually, we were able to hang some banners in this area after we had bought out 85% + of the hotel, then we were allowed some consessions here. 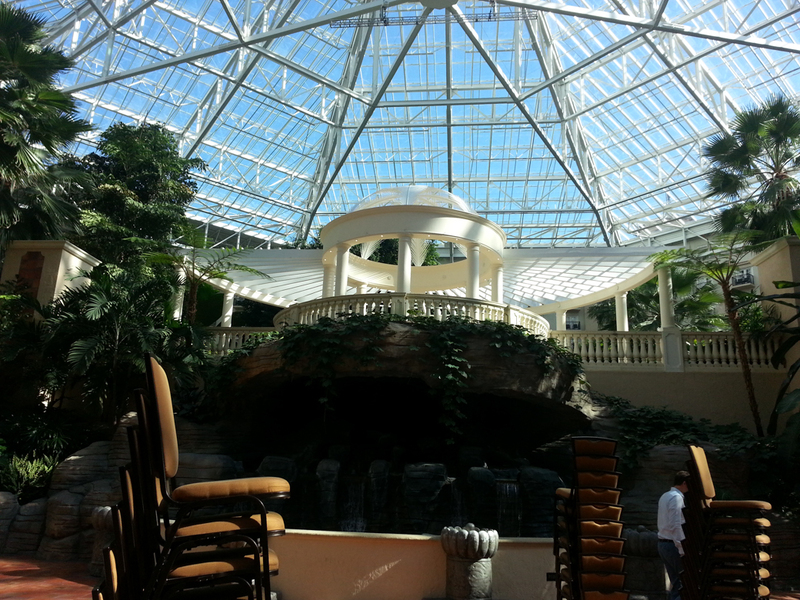 Once we left the hotel lobby we were inside the gaylord atrium (for those who have never been in a gaylord, its like a giant geodome with hotel and convention center contained within). Our first signage problem was discovered here, although there was rigging for a giant sign to hang from the ceiling, the foilage made it impossible to see. We did ask if the trees could be trimmed for our event, but the convention center staff told us that we had no control over the flora and fauna in the atrium. However when moving to the backside of the atrium this sign would be very clear over the archway. Here we were presented with our next signage issue. Here is an area that would be great for 2 extra large banners, but these banners would be covering the only air outflow to the atrium, i.e. covering these vents would prohibit air conditioning for the entire geo dome during the hottest months of the year. 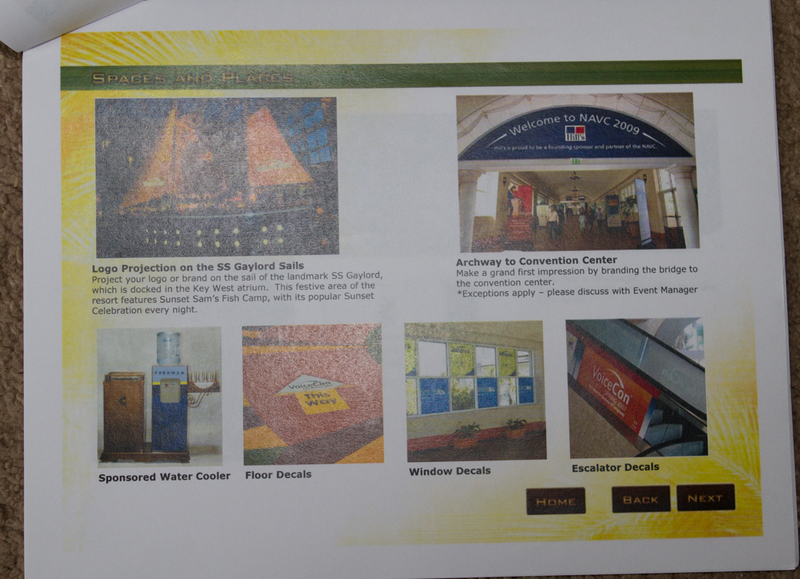 Our vendors The Sheppard Group and Britton presented the solution to use a mesh material for these banners. Though at this point testing was needed, I needed to find a way to imitate how mesh would look within this setting to get it visually approved by our creative director and to get it approved by the convention center to insure we didn’t accidentally cook our stylists in the geo dome. Next we crossed the bridge to the actual core area of the convention center. Here we were told that we could put vinyl clings on the windows, but we could only cover half at most of the windows along this bridge way. The next area was not so much of a signage problem but a logistical one. At the end of the bridge way was a small rotunda with a small escalator that only went up and another small escalator that only moved down. There were also 2 slightly larger stairways, one moving up and one moving down. We were then informed that all traffic to any part of the convention center must go through this very small area. We would have 3,000+ women who would all need to use these escalators at the same time in 5 months. We immediately saw this as a problem and asked if the escalators could change direction. The convention center staff informed us that the escalators could not change direction, so we decided we would try to use signage strategically to get people to move where we needed them to, but at the same time stay out of the way of any foot traffic to not make the small walking area any smaller. 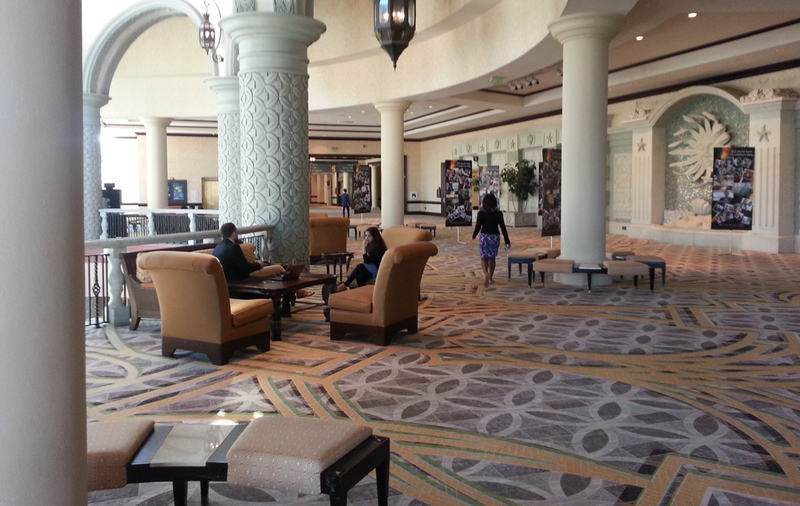 After taking the escalator up, we were in the area that would later be used as the registration area for our event. We had tried to think of other spots to have registration, but the size of the convention center did not lend itself to any area larger then this. 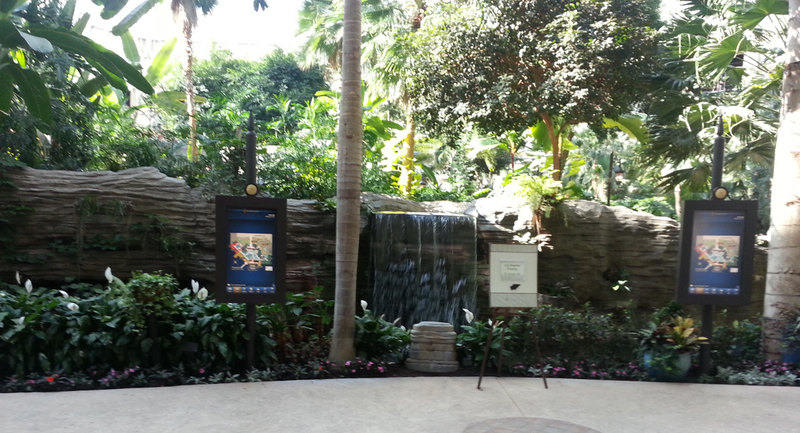 After viewing the area of registration, we went down the escalator twice to get to the exhibit hall level. 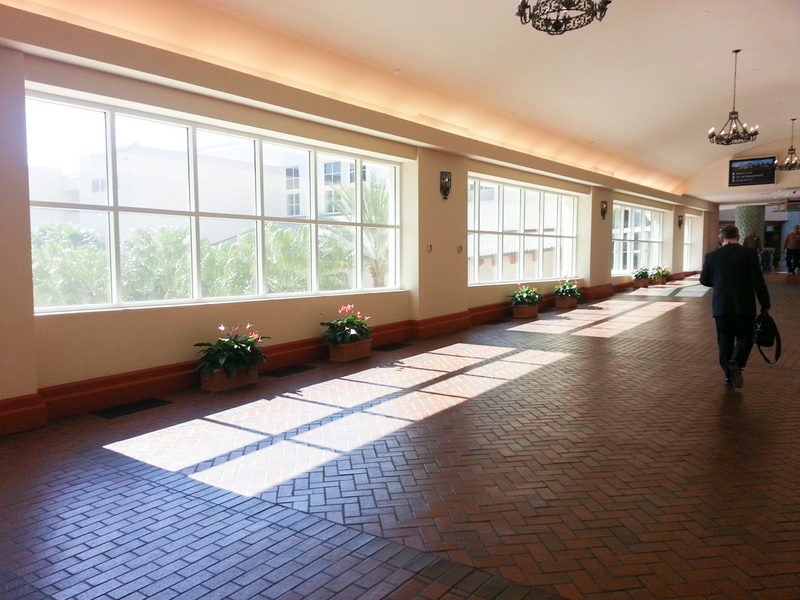 This was a long corridor with exhibit halls on one side and tons of windows on the other. We felt that we could likely utilize the windows for both directional and large images. 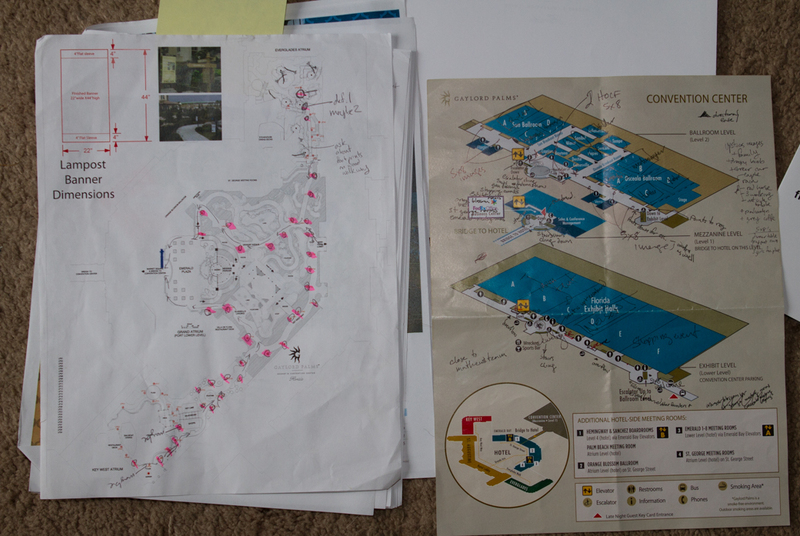 My project manager and I took notes while walking down the hall and began to map out the area. 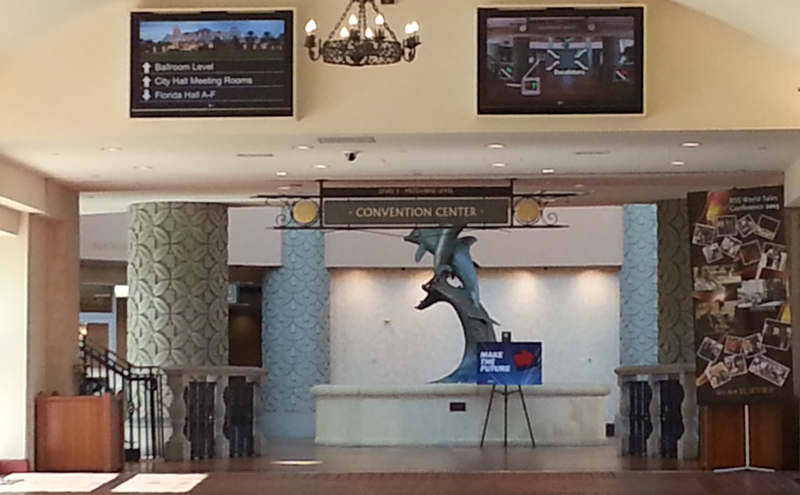 We also took care to get a few pictures of the various entrances to the exhibit halls. 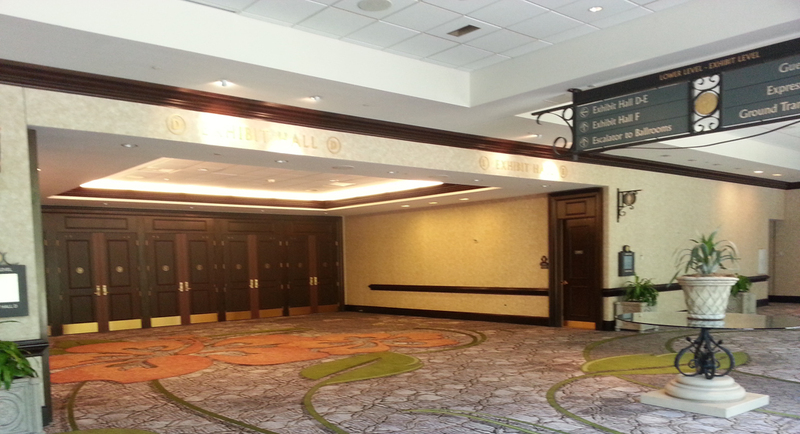 These would later be the entrances to the larger events we would hold during our convention. Challenges we faced here were low ceilings and no real rigging points. In the process of the visit we did a lot of walking around, took a lot of notes, and spent a lot of time looking at maps. Below are some of the notes I took while working on all of this. Here we had figured out where we wanted flagpoles, pop up banners, foot prints, window clings, freestanding displays, directional signs, and rigged signs. At this point we were ready to start creating artwork and mockups of how the final signage might work to get approvals not only from the creative director, but also from the various departments in charge of running this large event. At the end of our visit I had a very funny idea: wouldn’t it be funny to put in some fake branding options, each more outlandish then the last to present to the creative director? How extreme could I get them before the creative director would figure out it was not real. 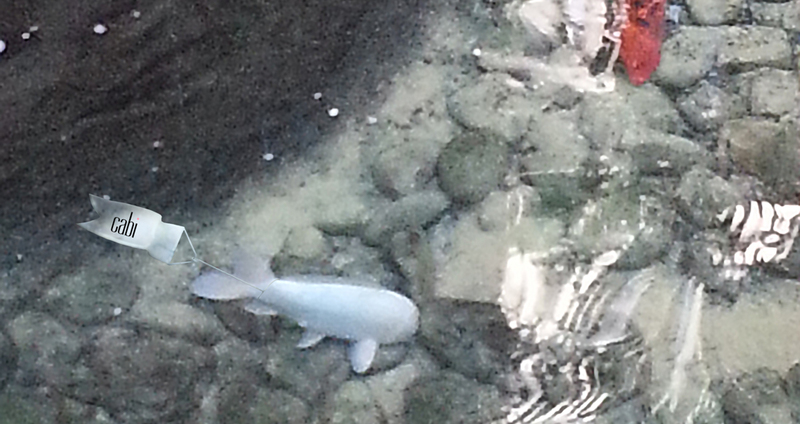 Within the atrium there were several wild animals kept. 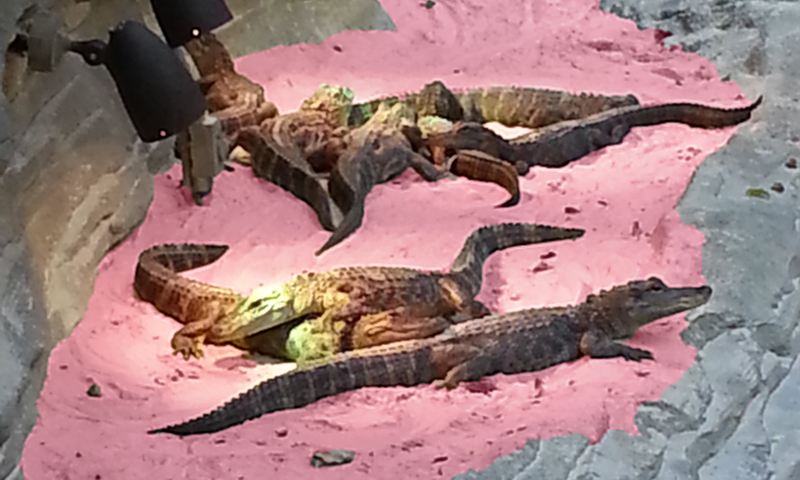 First I mocked up the idea of putting pink sand under the alligators kept in the atrium. This seemed mildly plausible. Next I mocked up painting some of the animals our branded pink color. This is slightly more extreme, but would not be taken kindly by the animal lovers in our office and amongst our Stylists. Really how hard would it be to paint some of the turtles pink? I know they make animal safe dyes for Halloween and other fun events. Would it really hurt the turtles to be pink? This was slightly less plausible then the alligator sand, but could still be believable. Last I decided to mock up something very ridiculous: Unfortunately the joke was discovered with the turtles, but the idea of people chasing the koi around with little tiny flags and tying them to the fish’s tails was quite funny and clearly impossible, but the mock up is wonderful.